Get ready for a world of exciting discovery with our Tunnel Labyrinth (8' x 8') soft play gym. 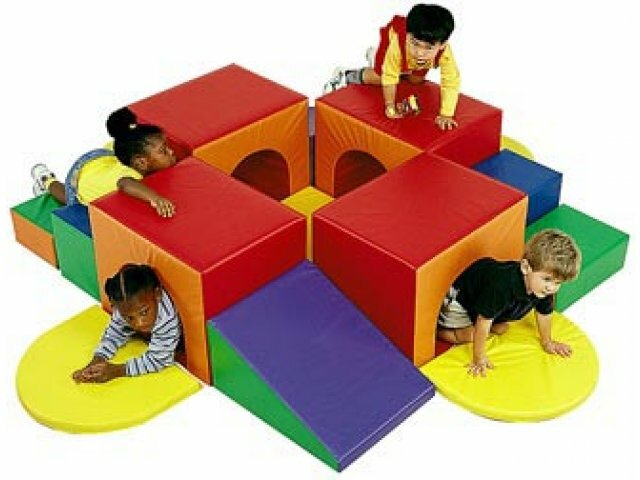 Four spacious tunnels are surrounded by soft squares and steps for hours of gross motor fun. 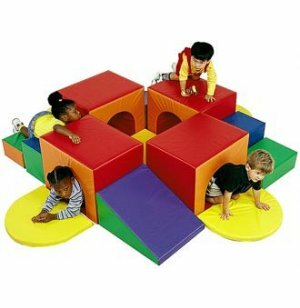 Appropriate for crawling babies and toddlers, this indoor gym invites little ones to explore spatial relationships, motor development, social skills and imaginative play as they crawl and climb in, out, over and up the tunnels, walkways and steps. All materials and colors are non-toxic, and the lightweight vinyl wipes off easily for no-hassle maintenance, making these soft play gyms kid-safe and teacher-friendly. Ideal for preschools, daycare centers and physical therapy rooms, these indoor gyms are the perfect thing to keep little tots busy, happy and physically fit. Durable: Comfortably supports adults up to 150 lbs; foam will not get damaged even if someone heavier sits on it. Beautiful Colors: Bright, cheerful colors appeal to small children.